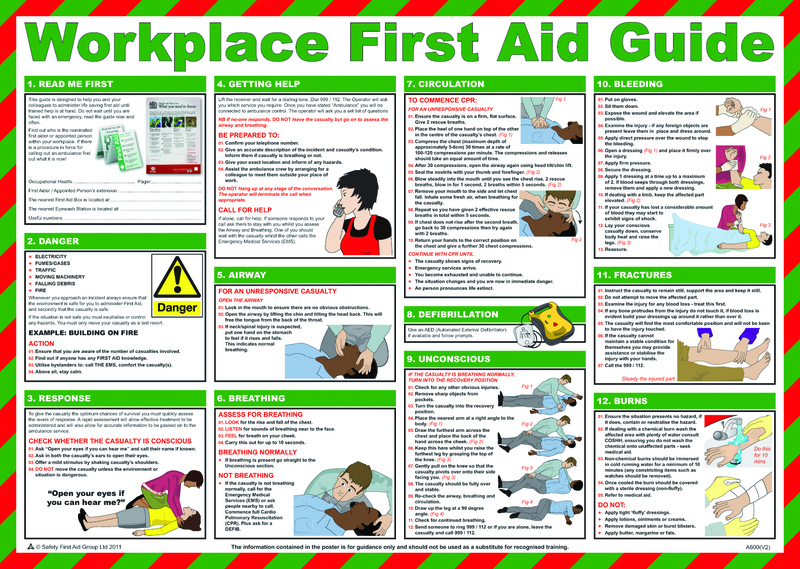 Knowledge of first aid and the skills to administer it are invaluable, and may be needed at anytime, anywhere. Proper training helps a person stay calm and properly evaluate the situation, preventing further injury to others or to him or herself. An injured person should never be moved unless absolutely necessary. If the person must be removed from a life threatening situation, knowledge of correct lifting or dragging techniques will help prevent further injury to the head, neck, and spine. If the person must be left unattended one needs to know how to set them in the right recovery position. Severe bleeding can quickly become life threatening and is one of the top causes of death in trauma situations. Assessing the severity of blood loss is not always easy, because even a small amount of blood may look like a lot when spread out. Knowledge of standard precautions will help prevent the transmission of disease. An obstructed airway, resulting in cessation of breathing, puts a person at risk for brain damage and death. Two main causes of a blocked airway are soft tissue, such as the tongue, and a foreign object. For example, when a person is unconscious and lying on their back, the tongue may fall back and block their trachea. Properly applied techniques, such as the Heimlich maneuver or jaw thrust, allow one to remove the blockade and let air into the lungs. Being able to assess the degree and surface area of a burn is essential in determining the treatment required. The elderly and very young are at high risk for negative outcomes from severe burns. Improper treatment can result in further damage. CPR is used in the direst of circumstances, to keep oxygenated blood flowing to vital organs, until help arrives or the patient resumes breathing naturally. Improper techniques can force air into the stomach and cause complications and vomiting. Programs such as CPR Classes in Chicago offer instruction in the correct application of CPR. Techniques for adults and children differ, so it’s important to have proper training. There are a number of programs which offer first aid classes, including the American Red Cross and the American Heart Association. The unthinkable can happen at any moment. Being prepared may make the difference between life and death or serious injury. Previous articleWhat type of Exercises help you to keep your mind fit?